By 1971, people had been in space. They'd even flown around the earth! But there'd never been a real home for humans in orbit—they went up, and they came down. That changed 40 years ago today. The Russians had won the race to put a person in space, and they were equally keen on putting up a place for humans to live. The Salyut program accomplished just this. Eventually. 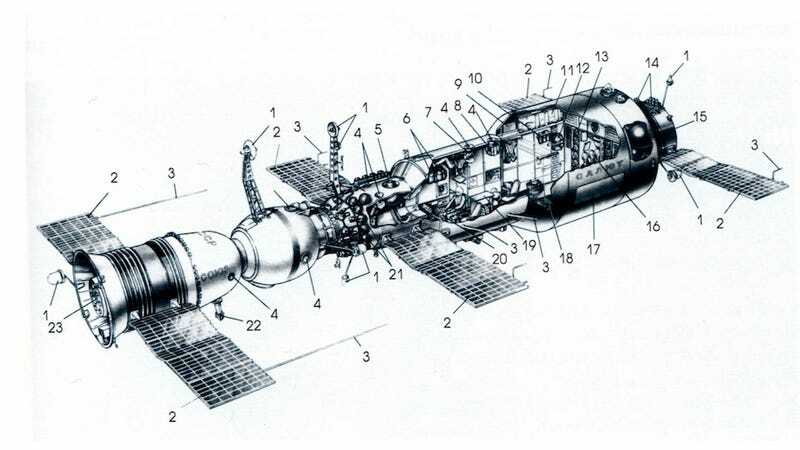 Salyut 1, small by ISS standards, was still able to fit eight seats and all requisite equipment to control the vessel and perform some rudimentary experiments. But it went unused for quite a while. Salyut 1 was launched without a crew—and sat there floating while a group of cosmonauts tried, and failed, to dock with her. It wasn't until a month later that Russia was able to actually get people onboard. Still—an imperfect start is still a start, and kicked off the habitation of the world's come together to fulfill.